Chuck Frey of The Mind mapping software blog is offering an expanded 3rd edition of Power Tips & Strategies for Mind Mapping Software. Recently received a copy directly from Chuck, and it's a rather good improvement upon his previous editions. Keeping his study, analysis and professional approach to writing, always with a critical eye on the mind-visual mapping genre. Worth grabbing this edition, as the developments within the graphical information management arena has grown exponentially since Chuck's previous edition. No one else writes quite like Chuck Frey, and his unique way of approaching the mind-visual mapping genre is a stable for many new and established Visual thinkers who feel the need to be informed of current practices and future trends. As Visual mappers: what should our approach be? I am somewhat challenged with my thoughts regarding the viability of continuously attempting to pushing something mainstream that has and continues to struggle for a wholesale adoption. 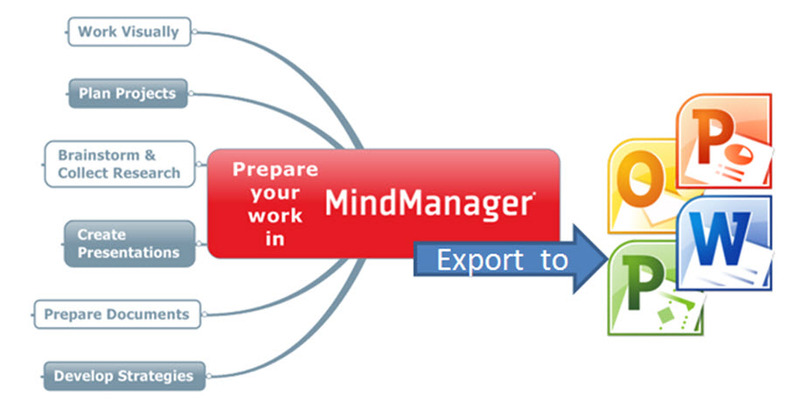 Mind mapping as a single radiant process has failed miserably to become a mainstream method globally. 40 years after the formalization by Mr Tony Buzan, and here we are still trying to justify its use and infusion into the mainstream. Many of our colleagues are even confused as to the designations and distinct differences between Mind-Visual and Knowledge mapping. Visual Mapping on the other hand is more descriptive of the multiple formats available for graphical expressiveness of information. Knowledge mapping/management seems to be the future key with connectivity to back end data bases; namely relational databases. Some are using tools such as Mind mapping and flow charts as rather good front end applications in the vein of dash boards and master map configurations. I would suggest that we are more effectively positioned as Information Managers and facilitators, who understand the value of Whole Brain information management. The Mind mapping arena, whilst an excellent format for initial exposure to more effective Information management processing has failed to capture the generations proceeding the initial formalization of hand drawn Buzan Mapping 40 years ago. It is rather amazing yet embarrassing to view the landscape and see some claiming Mind mapping to be the great panacea for the ills of current information management practices. I firmly believe we should debate an approach for this portion of this century; as we shall be passing on this initiative to future generations for further development and improvement. The potential strategy may be one of a focus on information management rather than a focus on the tools. The methods are important; yet the application of the mindset is IMO most important. Very few of our colleagues actually speak of the association with a mindset. I firmly believe the Body of Knowledge proposal made some years ago by Arjen Ter Hoeve and Wallace Tait was and remains to be an initiative that would solidify, verify and validate our purpose, Mission and Business model. At this time Pascal Venier and Wallace Tait are pro-actively seeking to prove the viability of such a venture; using current academic and business management system standards as benchmarks for establishment. In 2009 I was asked to develop and facilitate a scenario planning session using the tools and methods of visual mapping. 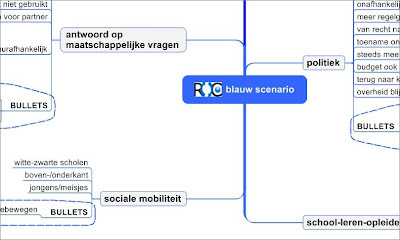 The board of directors of a Dutch training organization showed interest in the development of graphically mapped out possible future scenarios, so to be better prepared for future business opportunities. In the meantime I facilitated many of these sessions with other organizations and individuals, and the results were rather interesting! Fundamental changes are occurring in the ways in which we understand and solve problems. They influence most aspects of our personal and business life. Former tried and tested formulae of the past no longer fit to the future needs of problem solving and planning. Albert Einstein: “The significant problems we have cannot be solved at the same level of thinking with which we created them”. 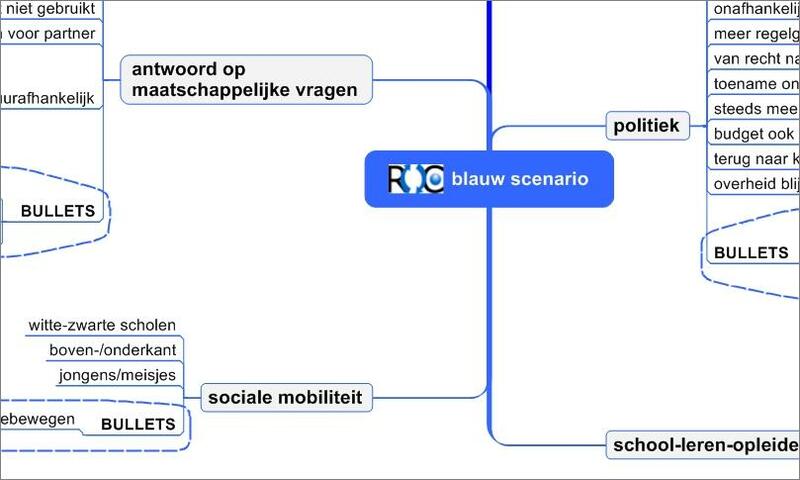 Scenario mapping is a robust strategic method which can be used in diverse ways. Scenario Mapping is a method where (after finding out what the core questions of issues are, together with the people and groups involved) in a mini workshop is explored what the driving forces and trends are. This is done with the help of mind mapping (by hand and/or with the help of software). The result of this form of Mapping is a set of ‘Scenario Maps’ which graphically express an alternative look at possible and/or impossible (?) futures – they are however not predictions! With the assistance of these scenarios an organization can react faster to current and probable changing business conditions and opportunities. Participants are often surprised by the speed and impact of Scenario Mapping sessions! What is the purpose of Scenario Mapping? • We seem to go off at a tangent – there is no common sense for what we see. Who should be involved with Scenario Mapping? It is important that everybody is invited who has a picture of the possible future. Just invite everybody whose interest can be stimulated to invest in the future of the organization. Apart from senior management; the inclusion of passionate employees, volunteers, customers, competitors (! ), local authorities, suppliers and partners are essential. 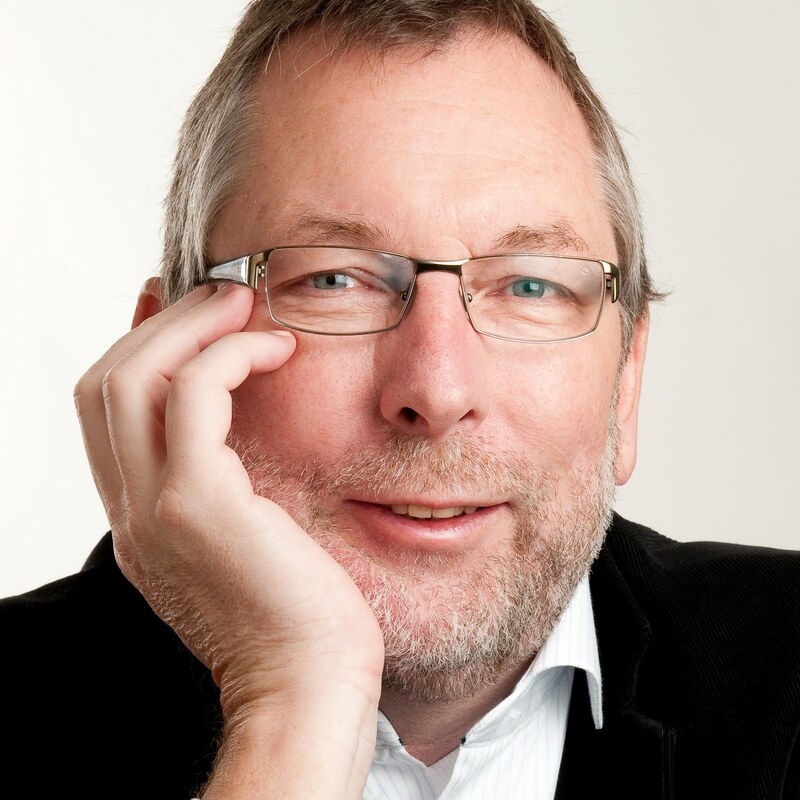 Hans Terhurne is a facilitator, trainer and efficiency coach using the ingredients ‘dialogue’, ‘visual mapping’ and ‘creative problem solving techniques’ to generate involvement and commitment for the next step in business management items. The name of his organization is CreaMatics – active in a systematic way and finding new solutions for today’s challenges. Linear thinking is integral with non linear thinking and processing (correspondence). The human makes decisions based on thoughts that produce data, which is made up of numbers, words and images. This data, when aggregated, becomes information, which when contextualized becomes relevant information. Information feeds the concept of knowledge, and depending on the specific management and application of knowledge, it makes us more valuable, which may be results oriented and in turn may be a measure of success. It has been said (flippantly IMO) we humans have a left and right brain (but of course there’s more); in fact we have a single unit brain that has a left and right hemisphere connected with some heavy duty tissue (wiring). Science has proven that when we use our brains to make a logical decision, we visualize the outcome first. Equally it has been proven when we visualize a scenario; we are calculating a degree of logic associated with the imagined scenario. Looking at a thermometer we see the measurement of temperature (polarity). We see a series of horizontal lines that express measurement, this indicates hot and cold. Depending on the higher and lower levels, we understand temperature. Where does hot and cold begin and end? For some this is questionable, the same may be expressed with sharp and dull, high and low etc. The poles of understanding are an expression of the choices we make according to the correspondence of the data/information/knowledge processes. Arriving at an understanding of why things happen (cause and effect) is crucial IMO. The inter-connectivity between the two previously mentioned principles is evident. Causes have effects and effects have causes. The forward thinking information manager of this century is neither a left or right oriented thinker. This person is a visual mapper, a whole brained thinker who understands there is a process approach to expressing system using the tools, methods and mindset of visual mapping. There is indeed a greater understanding of the implications of the monetized aspect of what we may call the information economy, and I firmly believe it is prudent to entertain the three principles mentioned. 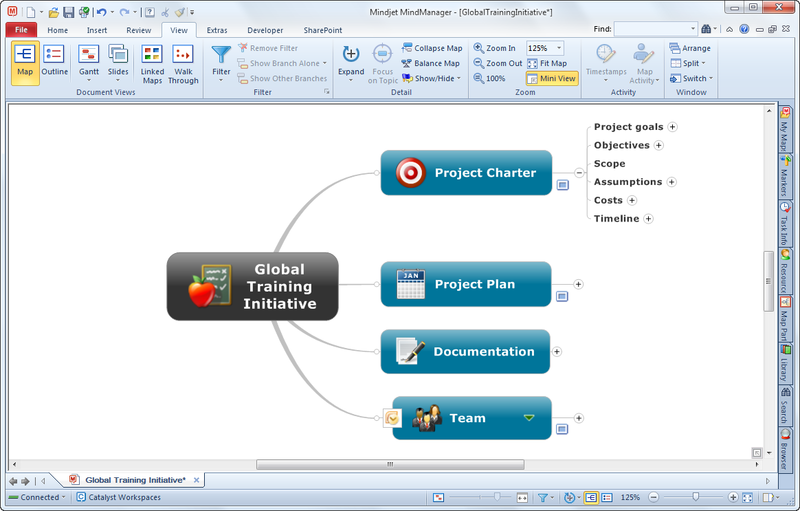 San Francisco – August 10, 2010 – Mindjet®, the leading provider of software and web- based applications for visually organizing and managing information and ideas, today announced the general availability of version 9 of its visual information mapping software, MindManager. 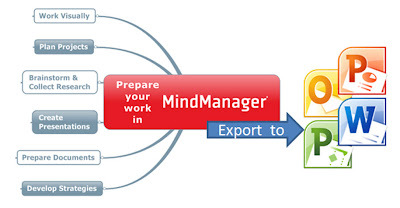 MindManager gives information workers the resources they need to see the big picture and all the relevant details needed for analysis and planning, within a single, easily edited view. MindManager, already used by over 1.5 million business professionals worldwide, is taking a quantum leap forward with this new release of its flagship product. This latest version greatly enhances the usability of Mindjet’s award-winning application, allowing it to integrate more seamlessly with users other MS Office applications, web services and collaboration platforms. 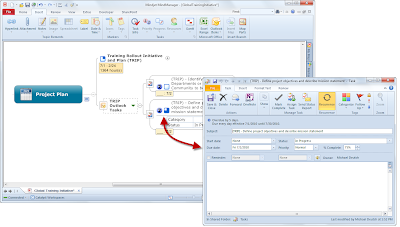 • Microsoft Outlook® Integration – Features more powerful integration with Microsoft Outlook tasks, emails, notes, calendar items and contacts to easily bring relevant information from Outlook directly into your MindManager maps for greater access and visibility into your projects and work. 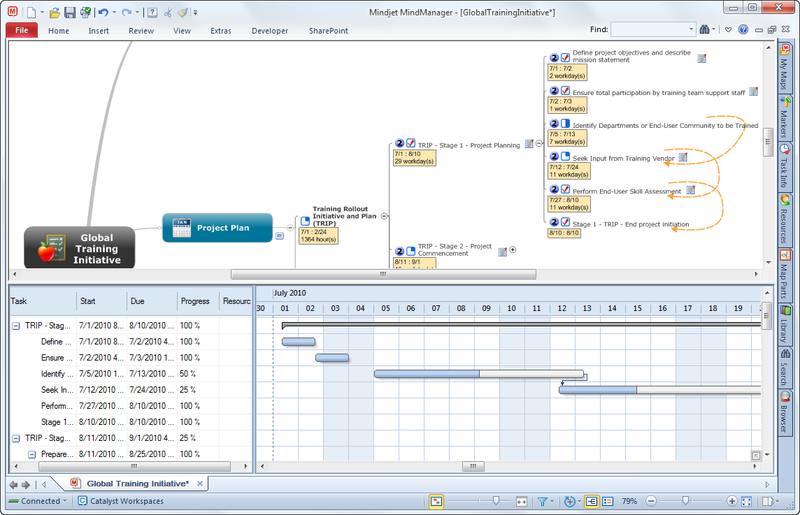 Synchronized branches of Outlook tasks can be added to maps and visualized in MindManager’s integrated Gantt chart. 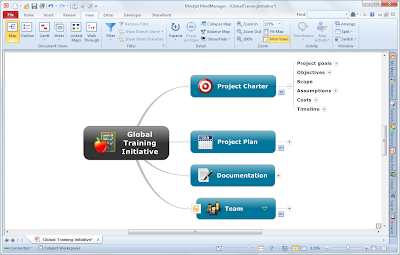 • Microsoft PowerPoint® Integration – Users can now easily use MindManager to research and map out presentations and then export their ideas from MindManager directly into PowerPoint slides to accomplish more, faster. • Interactive Slide Shows – Unlike ‘broadcast’ presentations, MindManager introduces a new way to present and collaborate on concepts, strategies and plans. Users can launch interactive slide shows directly within MindManager to review selected portions of their map, solicit feedback and update their map content directly in each slide. 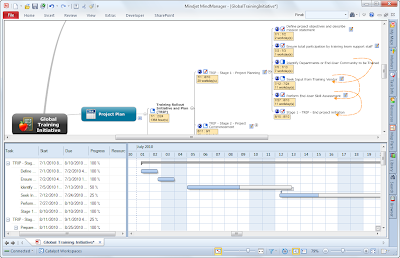 • Gantt Chart and Resource Views – Individuals can view task and project plan timelines in MindManager’s integrated and synchronized Gantt chart. 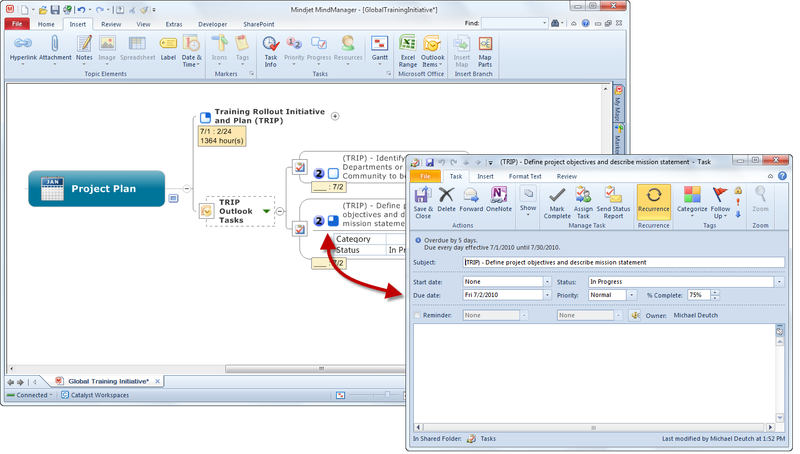 Updates can be made to maps by adjusting the Gantt chart or by making changes directly into a map. The resource views highlight when individuals are over or underutilized in both your map and the Gantt chart. 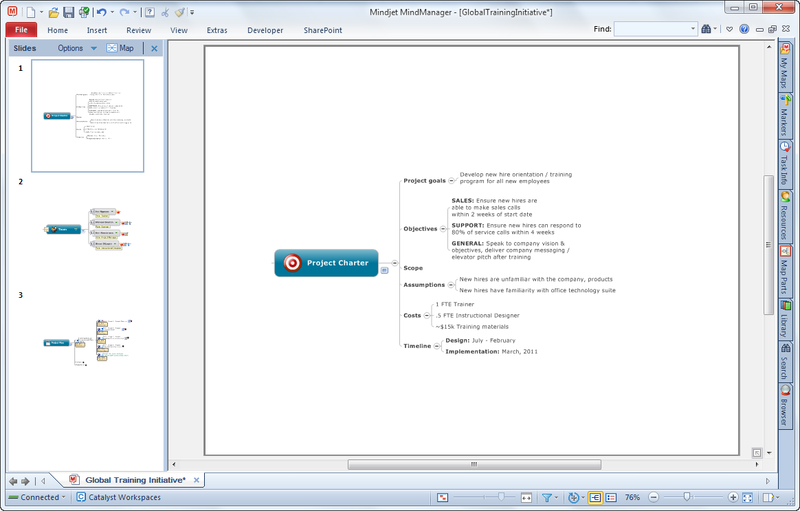 • MindManager Explorer for SharePoint (sold separately)– Visualizes SharePoint content in MindManager’s easy-to-use dynamic maps. With bi-directional SharePoint integration, users can more easily discover, aggregate and update their SharePoint content from one or more SharePoint sites. 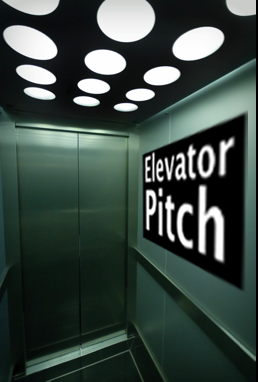 I'm often in a situation where I meet someone and they ask what I do and inevitably what Visual mapping is, After I bore them to death with the information management consultant thing, I present my elevator pitch regarding Visual mapping. Imagine a flexible framework that supercharges your information management skills. I call it Visual mapping: which utilizes Mind/concept/flow/argument and project mapping. When you adopt this framework, you’ll improve the way you generate, handle and exchange information. Become a superior information manager who creates with clarity, manages effectively, delivers on time and improves continuously. Yes I know, it can sound a little manufactured and almost presumptions, but it does get inquisitive reactions and leads to some interesting business contracts.